I use to be quite the couponer, but ain't nobody got time for that anymore (well at least not this girl)! I mean, these days, we are lucky if we ever even make it to the store for groceries! But I still love finding ways to either save a few bucks at the store or even better make a few dollars when I shop. I had known about ibotta back when I was couponing, but I never kept up with it. 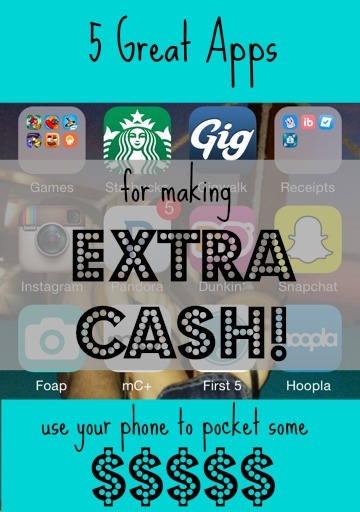 But when my sister-in-law reminded me of it a few weeks back she also told me about a few others apps that you can download in order to make a little side cash. ibotta- I gave it another go and actually love it. It is so fun scanning the barcodes with my phone! Plus, it is the receipt App I have made the most money on so far. I use to use it before I shopped to try to add things to my list, but I found that I was buying stuff I never used. Now, I wait until after my trip, I plug in where I shopped and search the deals to see if any matched. Most of the time they do. There has been a handful of times when I don't make any money off a shopping trip, but then there are others where I will hit it big and have 5+ deals on one receipt. Usually though I am least get one match. You can also take part in challenges each month, with changes to earn even more. For example, October's challenge is to redeem at least 10 rebates worth $0.25 and to have a team rebate total of $10. You can connect with friends who also have ibotta, so the more people on your team the more chances of hitting the goal. If you would like to join my team you can use 'ndvyayn' when you sign up. You don't have to, but I would love to have you join in on the fun with me! Plus, we both get a little incentive with your sign-up. You can cash out once you hit $10 and receive your money through Pay Pal, Venmo or get a gift card (lots of options to choose from). 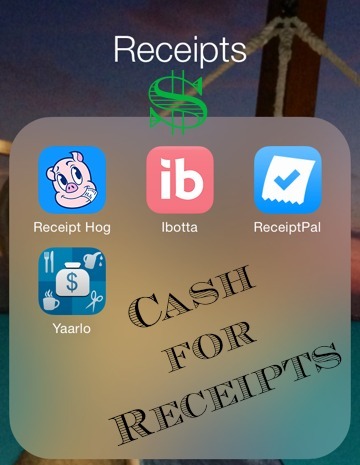 Receipt Pal- Receipt Pal is my second favorite receipt app mostly because they take pretty much everything and each receipt is worth the same point value. So they can add up quickly! You basically just take a picture of your receipt and once you get a square filled (4 receipts) you score 100 points. Think of all the fast food, gas, Starbucks... runs you go through in a week. It will really add up quick. Companies basically just want to know how and where you are spending so companies can better know how to advertise. One thing I don't like as much about Receipt Pal is that you don't have a Pay Pal option, but gift cards are always great!! Yaarlo- This is another receipt app that simply wants to know how and where you are spending money. This one sounded appealing to me because, like receipt pal, they also take pretty much any receipt. They also give you %1 of whatever your purchase total was in cash. That is how their reward system works. To me it sounded like it could build up fast, but then I realized that most of my daily purchases are really small. So this one has taken a while to build, but it's pretty much the more you spend the more you earn. Which I guess can be said for all of them, but this one in particular. This is another one where you can get a little bonus if you want to use my code (MELANIES285). You can get paid through Pay Pal or you can get a gift card to places like Amazon, Target and Starbucks. Receipt Hog- This one has taken the longest to build. They only accept certain receipts (mostly grocery stores) and are based on a point system. The larger your purchase, the more points you get. Most of my purchases under $10, which only counts for 5 points. If you have a large family and your purchases are higher then your points will build quicker. I do love getting to play the little piggy slot machine though which you earn spins towards on purchases made at major department stores. Receipt Hog doesn't currently accept gas or food receipts. You can use my referral bonus for some bonus spins for us both (cloft568). You get your cash through either Pay Pal or as an Amazon gift card. Gigwalk- This is the app I have made the most money through ($50 since I joined). However, I also live in a very large city and there always seems to be an assignment available. I actually haven't taken one in a while because they have all been for about $3 and they aren't anywhere near places I am going. Sometimes you get lucky though. I took a $30 gig that happened to be on my way while running errands and another right near where I work ($15). Most gigs average at about $5 and involve going to places like 7'11 to see if they have a specific product on display the correct way. You get a gig by applying for it and waiting to see if you were the one chosen to complete it. So you do somewhat have to plan ahead. I usually hear back within a day, but there have been some that have taken longer before hearing if I was accepted or declined for it. That's one of the downsides to being in a bigger city. Sure there are more gigs available, but there are also a whole lot more people competing for those gigs. The receipt apps are great because you can always do them, but Gigwalk is worth taking a look at too! If you are like me and love playing around with time sucking apps anyways, why not at least play around with some that will reward you right?! Most of the time my husband hates my phone, but he doesn't mind it so much as long as he sees receipts sitting next to me. Heck, he even saves his receipts and gives them to me at the end of the day. Speaking of Time: The receipt apps don't really take that much time. More often then not I will snap a picture in my car while I am riding shot gun on our way home from dinner. If I do happen to make it home I will put it on the kitchen counter and wait a day or two, let them build up and then snap them all at once, which usually takes no more than 3-5 minutes and I do it all while watching t.v. What about you? Any apps you love using that offer fun rewards? Here's to a little extra cash, happy rewards and FRIDAY! Hope your weekend is full of all this happy!! I've never done any receipt apps, although i like the idea of them! thanks for breaking them down- gigwalk sounds fun! It is! Definitely gives you an inside view to a lot of different things. And the receipt apps are my fave :) Happy Sunday! Sounds awesome! I'll have to check some of these apps out! :) They are pretty fun! Have a great Afternoon! These look awesome! Totally news to me! Thanks so much for sharing and for linking up with The Alder Collective! Hope to see you again soon! Have an awesome week!